Do organic and conventional farmers use similar amounts of pesticides? 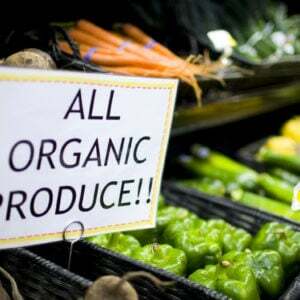 Why do consumers prefer organic to conventional produce when both use pesticides? One of the things that has really begun to stand out in the debate between advocates of technologically progressive agriculture and the critics of technological agriculture is the persistence of the idea that the use of pesticides is still a major problem, if not the central environmental impact of agriculture, that needs to be addressed. This is unfortunate. It’s just not accurate. It’s a cul-de-sac in the discussion about how to improve the environmental footprint of agriculture. It’s a distraction from the addressing the major environmental impacts. Before getting into the details of our story, I’d like to take a quick look at the big picture by way of the raw trend in pesticide use in the US. The USDA recently took a look last year at the use of pesticides since 1960. What they found is that use peaked in 1981 and has remained fairly steady with a small decline from 1981 to 2008. There are two important variables that aren’t caught in that graph. The first is that it doesn’t capture the improvements in the pesticides used. As we’ll see, the pesticides in use have become less toxic and more degradable over time. The second thing to keep in mind is that the population of the US in 1980 was 230 million, in 2008 it was 304 million. Yields have gone up dramatically. So, while use per acre has only modestly decreased since 1981, it has gone down dramatically both per capita and a per unit produced, while the toxicity and biodegradability have improved. That’s not to say that use per acre isn’t important, but we should keep aware of other ways of assessing what’s going on to get a fuller sense of what has actually happened. The disconnect between public perception and clear improvements mostly comes from the chemical hangover people are still feeling from the unfortunate excesses of industry during the 1950s, 60s and into the 1970s. DDT, PCB’s, a raft of dangerous food colorings and additives pulled from the market, Love Canal and similar incidents left people with the unshakeable feeling that everything causes cancer and technological progress might be more trouble than it’s worth. People have a much better handle on that dismal chapter of history than they have on the reforms and innovation that followed. With creation of the Environmental Protection Agency and the passage of the Clean Air and Water Acts, regulation has become much tighter. Meanwhile, scientists began working in earnest to create pesticides that were more effective, better targeted at the pests they were aimed, while leaving a lighter footprint everywhere else. Environmental watchdog groups have worked hard to make sure that they do. 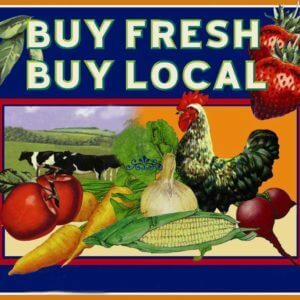 Another source of disconnect is the way organic farming has been marketed as free of pesticides. 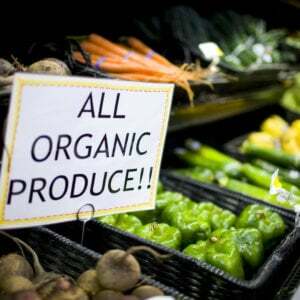 Leveraging the false public perception that organic farms don’t use pesticides, organic marketers advocates and advertisers exaggerate their harms on the environment and the risks for consumers. In denying their own pesticide use, while playing up the use in conventional agriculture, the organic industry has played a big role in shaping public perception on the issue, and not for the better. All of these threads have come together to create a widespread lack of understanding that modern pesticides are much safer than an earlier generation chemicals. Many pesticides have been banned in recent decades and new chemistries that have been approved are much more targeted in the way that they work. Following the uproar over DDT, scientists have made degradibility a central priority, so today’s pesticides are far less persistent in the environment. The discrepancy between the actual environmental impact of pesticides versus how they are perceived was brought home a few years back with the publication of “Leverage points for improving global food security and the environment” in the journal Science by a group of University of Minnesota scientists. I was surprised at the time to see that reducing pesticide use wasn’t a top priority. The environmental impacts highlighted include water use and irrigation; nutrient leaching and eutrophication due to excess nitrogen and phosphorus; land use, especially tropical deforestation; and greenhouse gases, especially N2O but also carbon and methane. If you look at the research on the environmental impacts of food production by researchers like geophysicist Gidon Eshel of Bard College (Michael Pollan’s go-to source on these matters) you will find a similar set of concerns and the same absence of pesticides as an environmental concern. When you really dig into the research on the hierarchy of ecological impacts, pesticides represent a drop in the sustainability bucket when compared to land use, water use, pollution and greenhouse gases. In fact, it may seem counter-intuitive but, pesticides can play a substantial role in mitigating the damage associated with many of those other factors. Pesticides allow for us to grow more food on less land, limit the wasting of fuel and water, and help curb erosion and run-off. There is nothing sustainable about pouring inputs into growing food that is destroyed by pests. In conversations however, I continually find myself talking to people who would happily trade the need to use more land, more manure, more water, more fuel in exchange for decreasing pesticide use. 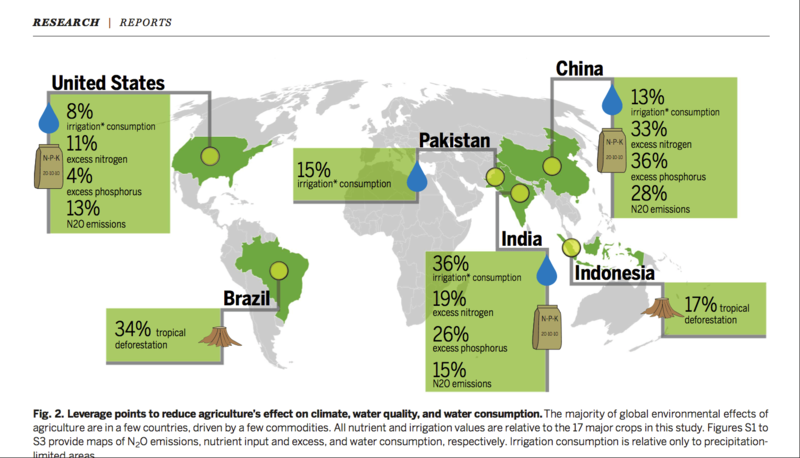 In a world of trade offs, this is getting the calculations and priorities on environmental impacts exactly backwards. What’s changed about pesticide use since Silent Spring, Rachel Carson’s 1962 classic book that ignited people’s concerns about the environmental downsides of pesticides. It’s true that pesticides, when misused, still pose risks to farm workers, and a few pretty nasty pesticides are still in use. For instance, chlorpyrifos, an insecticide has been linked to developmental issues in the children of farm workers. Methyl bromide, a soil fumigant has been linked to ozone depletion and cancer risk for farm workers. A phase out of methyl bromide ended in 2005, use of methyl bromide in the U.S. allowed in strawberry production under an “critical use” exemption to the Montreal Protocol on ozone depletion. That exemption ended in 2017. These are important challenges, but their use is decreasing while the use of more targeted and less toxic chemicals steadily increases. Unfortunately, given a chance to follow through on a move to remove chlorpyrifos from the market begun by the Obama administration, the Trump administration declined. Chlorpyrifos is an organophosphate insecticide, perhaps the most problematic class of pesticides. Organophosphates are nerve agents, and the way they kill bugs also works on animals and humans. The good news is that the use of organophosphates has been steadily declining over the past three decades as this chart in Science shows. I see them much more as farm worker’s health and safety issue than an environmental or consumer issue at this point. In the last few years, agriculture expert and writer Steve Savage has done great work breaking down common misconceptions about pesticide use. 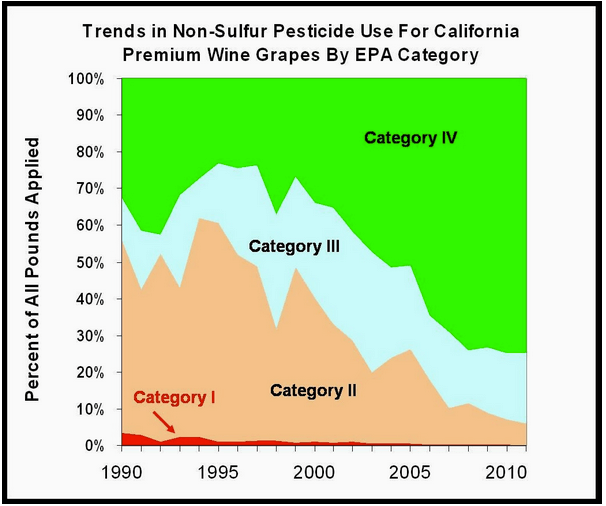 In a post using the California grape industry as a typical example, he shows how the profile of pesticide use has dramatically improved over the years. Contrary to campaigns by environmental groups and anti-GMO activists that talk about a “flood” of “toxic pesticides” unleashed since the beginning of the biotech era, the data show usage shifting dramatically away from Category II (moderately toxic) and Class III (slightly toxic) towards Category IV (practically non-toxic) and the almost complete abandonment of Class I (highly toxic) pesticides. This pattern is repeated across almost all grain, fruit and vegetable farming. 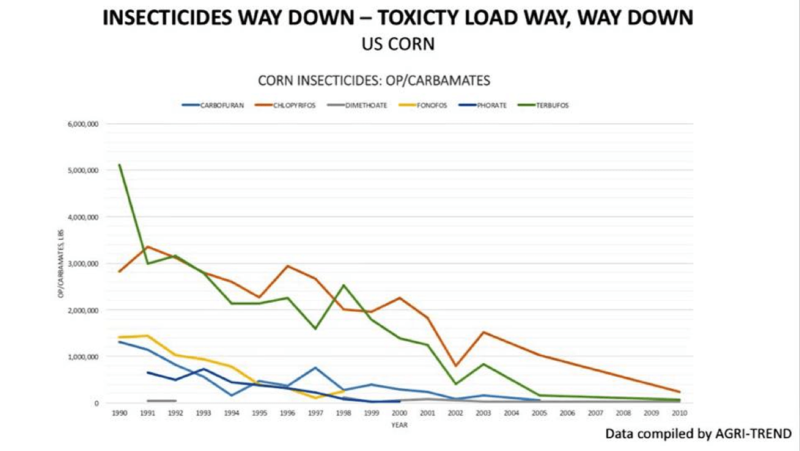 In another post putting pesticide use into greater context, Savage shares two key charts. 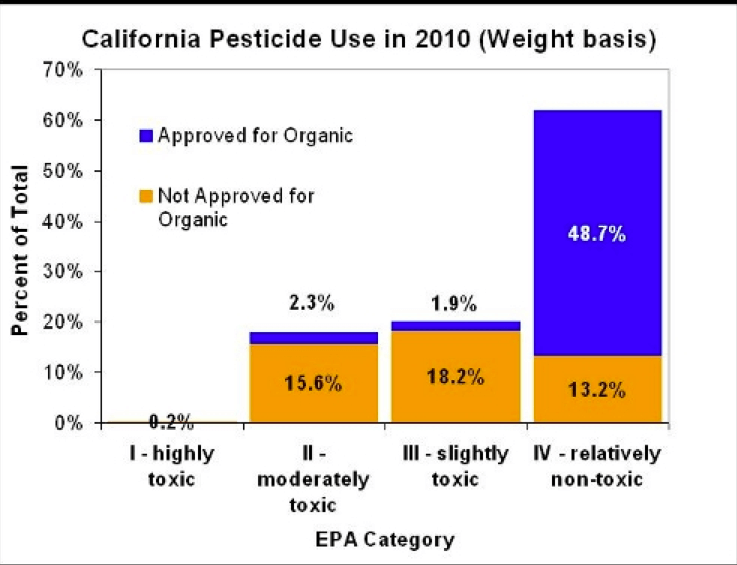 The chart above underscores that today’s most prevalent pesticides are relatively benign from a human health perspective: more than 60% of the pesticides used in California are classified as Category IV (relatively non-toxic) and another 20% are Category III (slightly toxic). Savage goes on to compare the amount of pesticides used in California in relation to the toxicity of substances that we popularly consider safe or even good for us. 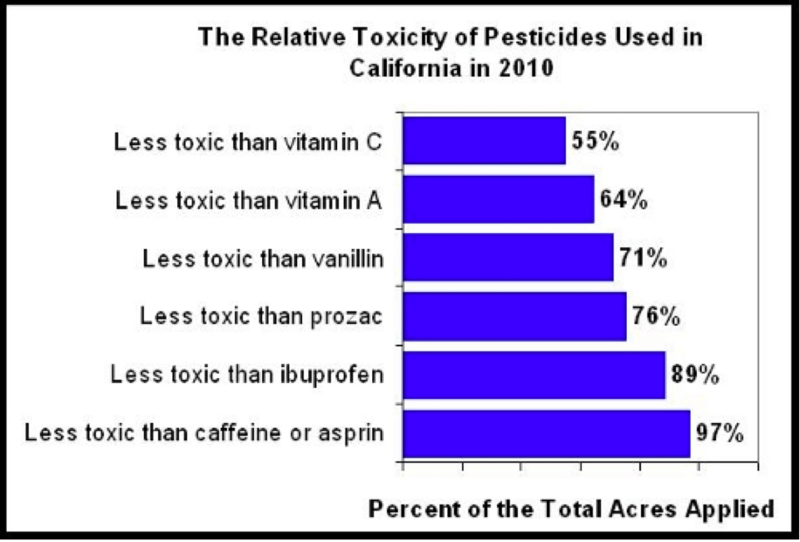 Nearly all the pesticides used in California are less toxic than caffeine or aspirin, with only 3% by acreage more dangerous than your favorite morning pick-me-up or your favorite pain reliever. More than half are less toxic by weight than vitamin C.
What drives the perception disconnect? 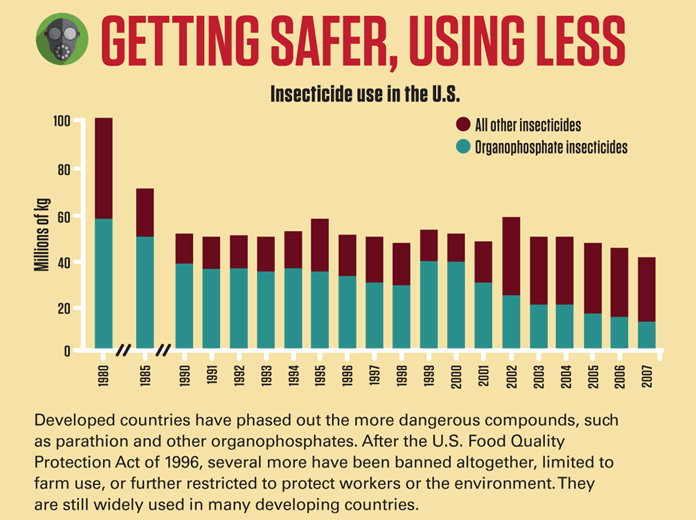 Savage also lays out the interesting story about what has contributed to the reduction in pesticide use and what forces are in place conspiring to keep these achievements something of a public secret. It’s worth quoting at length. 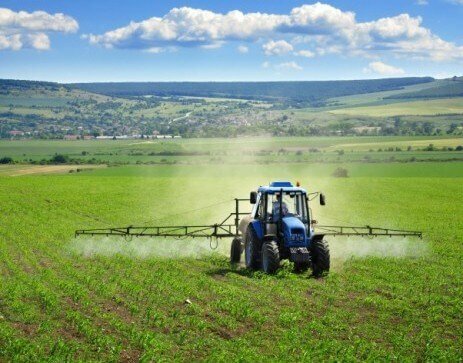 The Major AgroChemical Companies: These players have been investing hundreds of billions of dollars over decades to discover, evaluate, and commercialize new pesticide options. Their search has been for products that work better, which are more selective, and which can meet ever more sophisticated health and environmental standards. Without this investment, between pest resistance development, new pests and regulatory constraints, farmers would never have been able to accomplish the sort of productivity gains that have been seen. These players are actually constrained by the EPA from talking about new products as being safer than the older ones. They also usually have a mixed portfolio of newer and older products. Besides, in an anti-business climate their messaging is typically ignored. Government Regulators: If you step back and look at what agencies like the US EPA have accomplished over the decades, it is rather impressive. On the whole, the EPA has done its job in a way that is science-based and free from excessive political influence. As is probably the fate of any such regulator, the various “sides” on issues are all going to be unhappy with something about your decisions or bureaucratic procedures. Honestly, the EPA does not seem to have the skill or orientation for public promotion of what they have achieved (although this summary is pretty good). In any case the political Right tends to want to get rid of the agency, and the Progressive Left seems to think that they have all been “bought-off.” I have some direct experience with EPA staffers and a window on their process through friends who serve on advisory panels. This system isn’t perfect, but it deserves a great deal more respect than it gets. Pesticide use commands inordinate attention from the general public because they are seen as “unknown” and “scary”. The fears play into the well known inability of humans to to distinguish hazard from risk. Even the mere mention of the word “chemical” can touch off an extreme psychological and irrational reaction. Yet most fears are simple run of the mill chemophobia. Synthetic chemicals are automatically considered more harmful than natural chemicals, although synthetics are often specifically developed to be better targeted and less toxic. The general public tends to think just the opposite. Most of us are prone to fall prey to appeals to the natural. It’s the same reason we fear shark attacks more than slipping in the shower or driving when tipsy despite the fact that our bathrooms and drinking and driving are thousands of times more treacherous than swimming in the ocean. As consumers we are almost completely insulated from any serious health risks when it comes to pesticides. The residue levels in food, based on decades of empirical data, is mostly infinitesimal, and dropping. Chemophobia has been used as a major wedge among agriculture warriors, used as a political football in the culture war between organic and conventional agriculture. It’s understandable. While, deforestation in the Amazon or the deadzone in the Gulf of Mexico may be of greater consequence, they don’t rate compared to the spector of pesticide residues when we are at the supermarket trying to decide what to feed our kids. Pesticide use, while not absent from organic farming, is perceived as the most visible difference that sets organic apart. 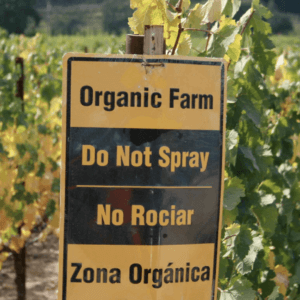 Pesticides are permitted in organic, some of them quite nasty. It’s only synthetic pesticides that are prohibited. It’s a perceived sustainability advantage, one that isn’t borne out looking at the evidence. When you dig below the surface at the environmental impact of various farming modes, however, organics fairs less well. On concerns like carbon, methane, nitrogen and phosphorus pollution, organic farming is less sustainable. Thus, much is made about synthetic pesticides, despite their relatively minor environmental impacts. Farmers generally use less insecticide when they plant Bt corn and Bt cotton. Corn insecticide use by both GE seed adopters and nonadopters has decreased—only 9 percent of all U.S. corn farmers used insecticides in 2010. 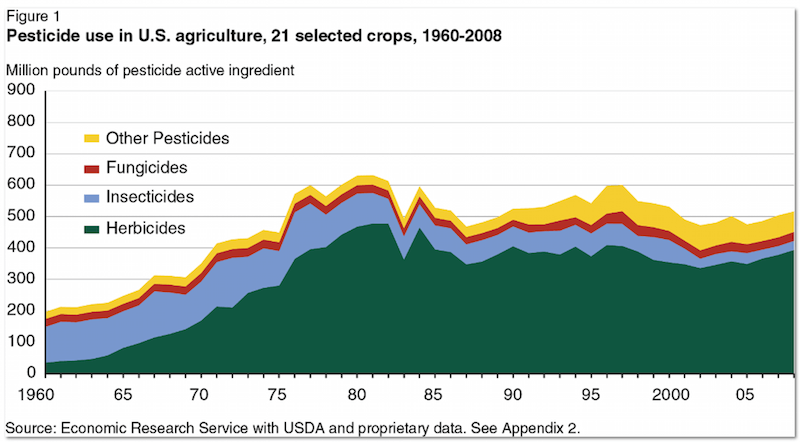 Insecticide use on corn farms declined from 0.21 pound per planted acre in 1995 to 0.02 pound in 2010. 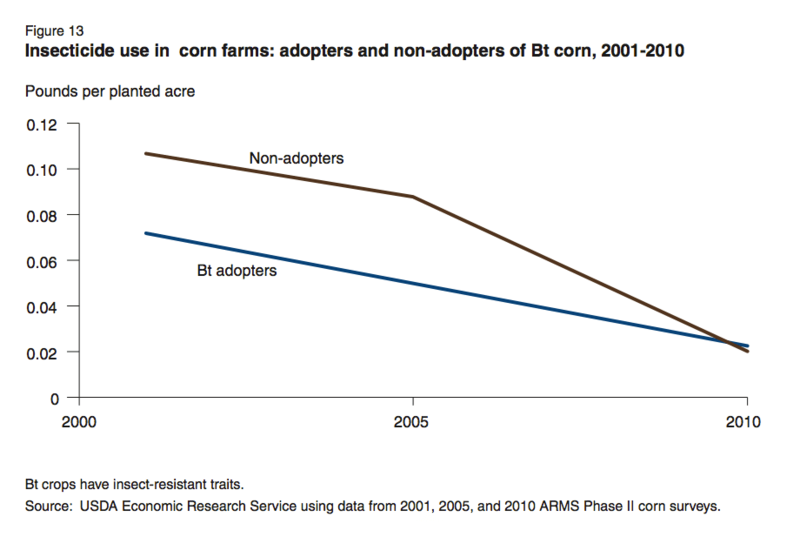 This is consistent with the steady decline in European corn borer populations over the last decade that has been shown to be a direct result of Bt adoption. Even farmers who didn’t adopt Bt corn benefited from the reduction in pestsBorrowing again from the infographic from Science, we can see how the use of soil applied insecticides plummeted as Bt corn planting became more widespread . Here’s use in corn broken out by insecticide. When I started asking about environmental effects, several experts who take a critical view of GMOs pointed me to an entomologist at the University of Arizona named Bruce Tabashnik. Yet Tabashnik was surprisingly upbeat: So far, he said, insect-resistant plants have been a clear win for the environment. “Because of them, we’re running the pesticide treadmill in reverse,” he said. The pesticide treadmill describes a problem that consistently occurs in agriculture. It goes like this: Eventually, insects evolve resistance to an insecticide, so the farmer starts using more sprays or something more toxic. But this can kill all the critters in the fields — not just the pests, but also the predators that eat the pests. Then the problem gets much worse. As time passes the farmer becomes more and more dependent on chemicals as the only means of pest control, using larger amounts, or more severe poisons, and getting less benefit. But transgenic insect-resistant crops have turned this process around, Tabashnik says. These plants produce proteins from a widespread bacterium known as Bt (Bacillus thuringiensis) that only harm a narrow set of insects. Bt itself is widely used as an insecticide, mostly by organic farmers. Because the Bt-producing crops kill some key pests, farmers spray less insecticide to control those pests. This allows beneficial insects to survive. With more insect predators there’s less need for insecticides, and when farmers do spray, the insecticides work better. 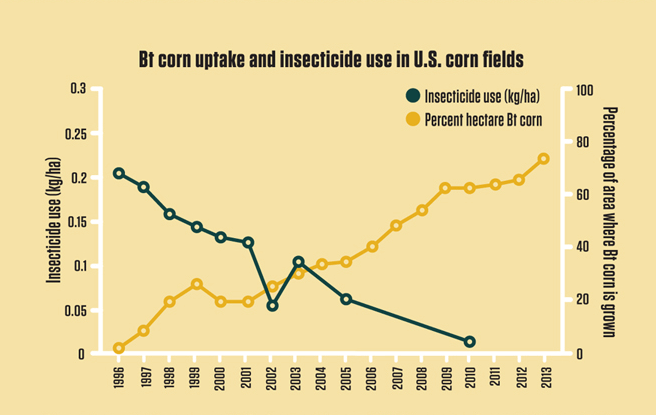 The link between Bt crops and the decrease in insecticide use is unequivocal. The numbers on herbicide use are less dramatic and the picture less stark–until you dig deeper. Glyphosate use has increased and total pounds of herbicides are up a little or down a little depending on what data is cited. 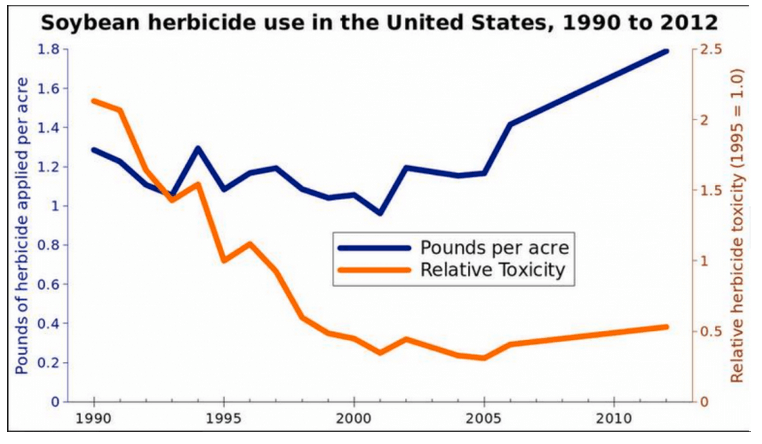 But the real story is the the most toxic herbicides have fallen by the wayside. Let’s take a look at the second and third most popular herbicides from the pre-biotech era. Prior to 1996, alachlor was the second most popular herbicide after atrazine. Alachlor is banned in Europe and strictly regulated in Australia. It presents some health risk to humans. The odd thing is that even though preservation of soil is a major goal of the Environmental Working Group and clean water is a major goal of Food and Water Watch, both groups put a lot of time and energy into opposing pesticides and biotech crops when biotech crops have helped to improve the profile and impact of pesticide use, while improving soil conservation. The role that glyphosate and other herbicide tolerant crops have played in the adoption of conservation tillage should be something both groups could get behind. 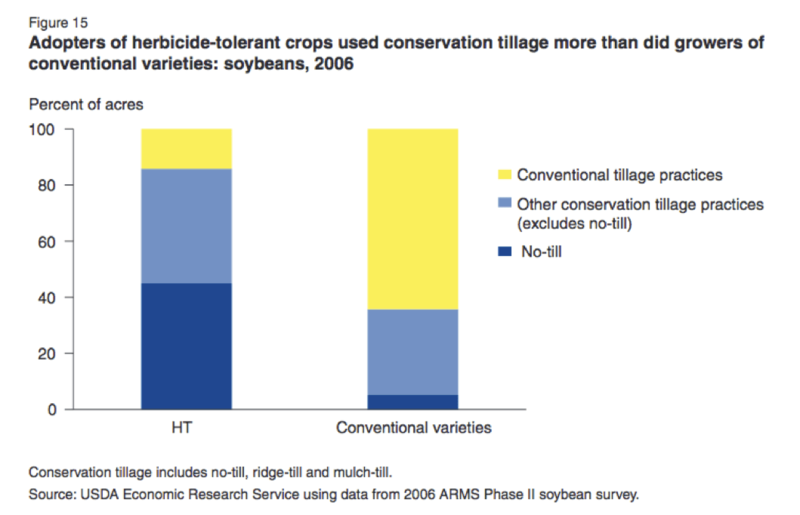 Conservation tillage reduces erosion, water use, and fertilizer run-off. Those are all big ticket environmental impacts, made possible in many cases by an herbicide that with a lower toxicity than table salt, and applied fairly sparingly. Just between corn and soybeans, we are talking about 100-150 million acres of conservation tillage. In one paper that tried to model the impact of Roundup Ready soybeans on reductions in tillage found “the adoption of conservation tillage and no-tillage have been about 10% and 20% higher, respectively, due to the advent of glyphosate tolerant soybeans.” That’s several million acres of no-till and conservation soybean production. For comparison, in 2016 there were 124,591 acres of organic soybeans in production, with the vast majority in conventional tillage. If organic farming researchers could finally figure out how to make no-till in organic soybeans viable with the roller crimper, that new innovation might be applied up to something like 100,000 acres. Over two decades after the adoption of Roundup Ready crops in conventional no-till systems, they are still struggling to make no-till viable in organic production at scale. The researcher who has looked at the environmental questions most vexing the public debate is Andrew Kniss, a professor of weed science at the University of Wyoming. In 2017 he published “Long-term trends in the intensity and relative toxicity of herbicide use.” and Genetically Engineered Herbicide-Resistant Crops and Herbicide-Resistant Weed Evolution in the United States earlier this year. The 2017 paper attempts to suss out the question of what has happened to herbicide use on major crops over the last two decades: Has use increased or decreased, have environmental impacts increased or decreased, and what role the RoundUp Ready traits have had on those changes? In a blog post on the publication of the paper, Kniss summarized his findings. 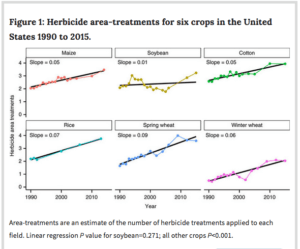 First of all, I found strong evidence that herbicide use has indeed increased in GMO crops (corn, soybean, and cotton), much as the critics have suggested. 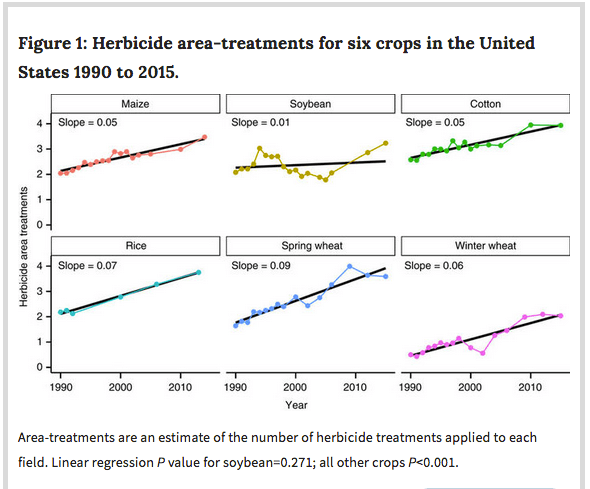 However, I also found that herbicide use has increased even faster in the non-GMO crops rice and wheat. This suggests that there is an overall trend for increasing herbicide use in all crops, irrespective of whether GMO varieties are available. 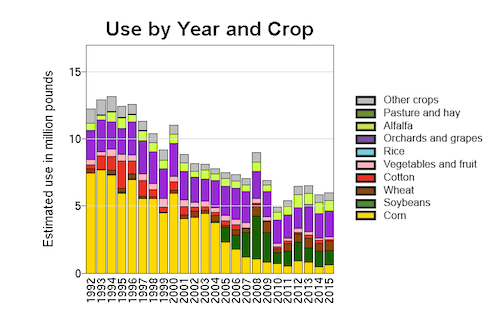 It is even plausible, based on these data, that GMO crops have slowed the increase in herbicide use (though it is impossible to say for sure). Another interesting finding from this analysis is that the trends in relative herbicide toxicity are different depending on whether you look at acute or chronic toxicity. Acute toxicity is what most people think of when they hear the word “toxic.” Acute toxicity describes how much of a chemical would be required to cause problems in a one-time exposure. Think spilling onto your clothes, or accidentally drinking the herbicide. But for pesticide applicators, the chronic toxicity of a herbicide is arguably more relevant, since they’re interacting with these chemicals on a regular basis for many years of their lives. It is rare for an applicator to accidentally ingest an acutely toxic dose; but much lower doses are required to cause chronic effects, as long as the exposure is repeated enough times. As a pesticide applicator myself, I was particularly interested in the chronic toxicity hazard results. Of the three GMO crops in the analysis, the chronic toxicity hazard associated with herbicides has actually increased in corn and cotton, but decreased in soybean over the last 25 years. But in all three crops, few of the changes in herbicide use that caused chronic toxicity to change are directly attributable to the GMO traits. 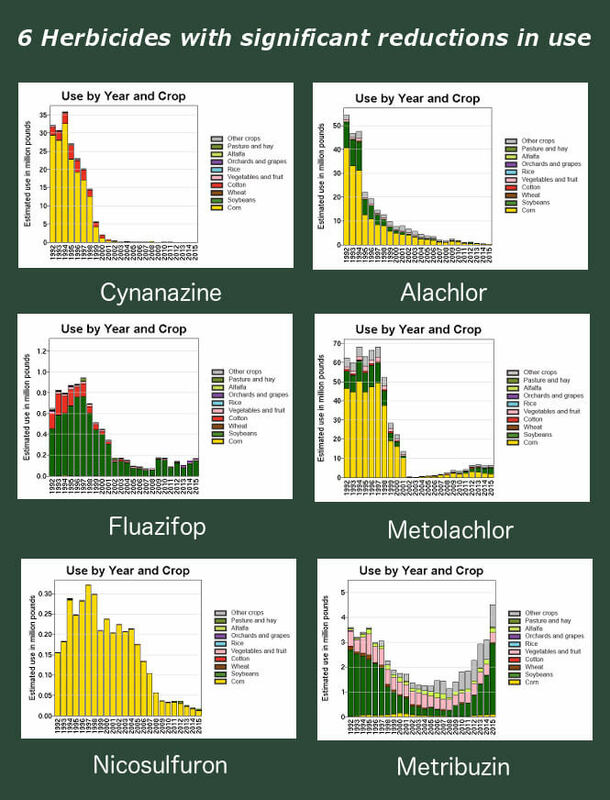 In the final year of corn herbicide use data (2014), just two herbicides (atrazine and mesotrione) made up 88% of the total chronic toxicity hazard. In cotton, just one herbicide (diuron) made up 88% of the total chronic toxicity hazard. Use of these herbicides aren’t tied to adoption of GMO crops; these herbicides were used before GMOs, and have continued to be used after GMO adoption. Even though glyphosate use has increased greatly over the last 25 years, my analysis suggests the relative contribution of glyphosate to the chronic toxicity hazard has remained relatively low. Glyphosate has a very low chronic toxicity compared to most other herbicides. In corn and cotton, the chronic toxicity hazard increased over the last 25 years, but glyphosate contributed less than 4% to the chronic toxicity hazard in the final year of the data set. Similar results were observed in soybean, where glyphosate accounted for 43% of all herbicide treatments in 2015, but glyphosate made up less than 1% of the chronic toxicity hazard. Another interesting finding in this paper is that most of the major reductions in toxicity hazard were unrelated to the adoption of GMO crops. 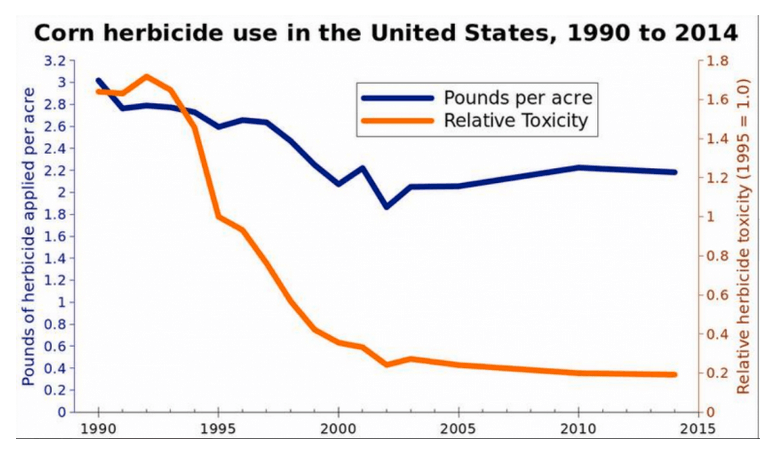 Where toxicity was reduced, it was mostly due to EPA removing the most toxic herbicides from commercial use. In particular, registration cancellations for cyanazine, alachlor, and molinate had major impacts on the toxicity hazard quotients in the analysis . The reduction in exposure to dangerous pesticides is a much, much bigger deal in developing countries like China, Pakistan, and India. Pesticides and their use are poorly regulated. 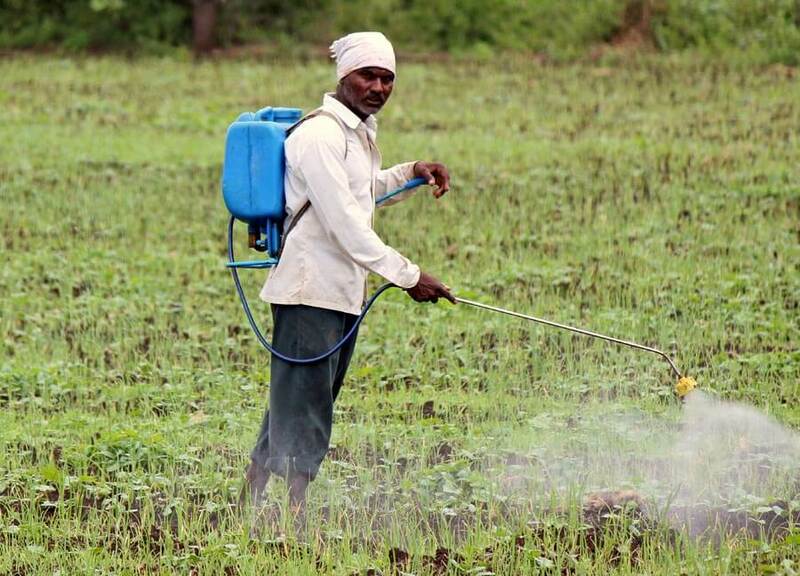 Unlike the US where pesticides are usually applied by tractor, often with a closed cab and with all the requisite protections, smallholder farmers apply pesticides on foot with backpack sprayers, usually with no protective gear. 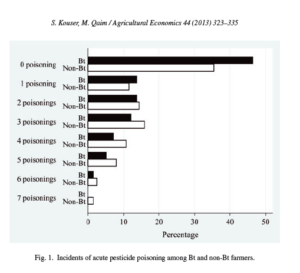 In the US, pesticide poisoning among applicators is very rare. In places like India, it’s far too common. Bt cotton was adopted early in China. 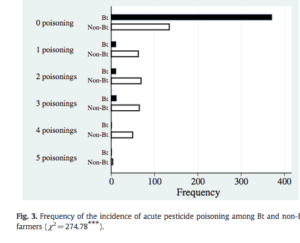 A 2002 study of the first five years found that in the first two years the rate of farmer-reported pesticide poisoning was reduced three to four fold among Bt adopters compared with non-adopters. More generally, they found that 4 million smallholders were able to increase yield per hectare, reduce pesticide costs and time spent spraying dangerous pesticides, while significantly raising incomes. A 2013 study found a significant reduction of pesticide poisonings among cotton farmers in Pakistan following the adoption of the Bt trait. The researchers conducted a survey of 352 cotton farmers, of which 248 were Bt adopters and 104 were non-adopters. “Farmers were asked about acute health problems that they had faced in connection with pesticide sprays in cotton during the last growing season. 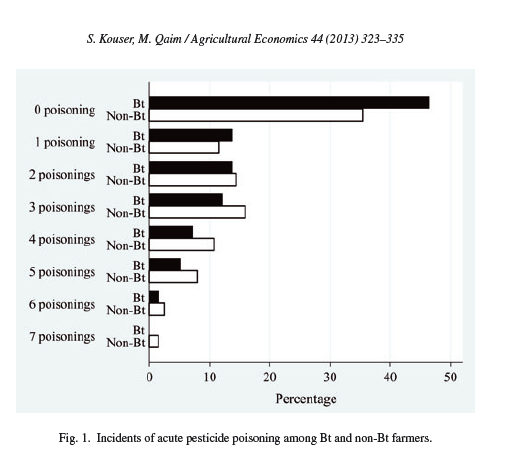 In particular, they were asked about the frequency and type of pesticide-related poisonings, such as skin and eye irritation, breathing problems, stomach pain, nausea, faintness, vomiting, and other symptoms.” The results, illustrated in the accompanying chart, found that the percentage of Bt farmers experiencing zero or just one incidence of pesticide poisoning were significantly higher than non-Bt farmers, while the percentage of non-Bt farmers experiencing three, four, five, or even six incidents was significantly higher than for Bt farmers. Some non-Bt farmers had as many as seven incidents, but no Bt farmers did. A 2011 study of cotton farmers in India found Bt cotton “reduced pesticide applications by 50%, with the largest reductions of 70% occurring in the most toxic types of chemicals”. In terms of poisonings, they found “Bt cotton helps to avoid at least 2.4 million cases of pesticide poisoning in Indian farmers each year, saving US $14 million in annual health costs.” More generous estimates put the reduction in the incidence of pesticide poisoning as high as 9 million. Reductions were low in the early years of adoption but grew significantly after 2005. As you can see in the chart, the difference in the incidence of poisonings among Indian Bt and non-Bt cotton farmers is even more dramatic than in Pakistan. A short blog post by Professor Andrew McGuire, an agronomist who focuses on helping farmers build healthy soils at Washington State University’s Center for Sustaining Agriculture & Natural Resources, highlights a clear case of where the judicious use of a pesticide, in this case an herbicide is the more ecologically sound decision compared to trying to avoid using the herbicide. In terms of the goal of building soil, the second option is plainly better than the first. However, some may argue that herbicides are toxic, that they may be a detriment to soil organisms, or that they could pollute the environment. If we used the herbicide glyphosate (the active ingredient in Roundup) its toxicity is low compared to other herbicides (the EPA considers glyphosate to be non-carcinogenic and relatively low in toxicity). The toxicity concern is limited further because we are not spraying a crop that is going to be harvested and the chemical is not persistent in soils. Any detrimental effect to soil organisms would be minimal compared to the obvious effects of tillage. Glyphosate also has a small leaching potential. For building soil, the choice is clear; spray out the crop. There is still room for improvement in the use and toxicity profile of pesticides, especially in other countries. Pesticides do get misused, especially in developing countries without strong regulations and little public spending on ag education and training. They can harm wildlife and pollinators. Farm workers need stronger protection. But the single-minded focus by many on pesticides ignores that we live in a world of trade-offs and producing the most food on the least amount of land, with the least amount of water, the least amount of erosion, the least amount of fertilizer runoff, and the least amount of greenhouse gases is a larger, more important set of goals. Those goals can often best be advanced through smart use of some fairly non-toxic tools.